I don't write to follow the trends, but I do enjoy keeping an eye on them. 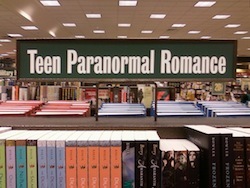 I've heard rumors that the popular young adult sub-genres are a-changin'. We all know that the market is saturated with paranormal romance and dystopians. I read in a blog post - can't remember which one for the life of me - that editors and agents feel these particular trends are waning. Which I really hope isn't true, because the novel I have out on submission happens to be a juicy paranomal romance. But what the publishing world is predicting to grow is interesting. Young adult horror. I've seen a few titles already that fit into this. First couple that come to mind without Googling it are The Long Weekend and The Line. I've yet to read either but I can't wait to get my hands on them. I have an odd addiction to scaring the bejeezus out of myself. What do you think? Could you stand to see a little more gore and suspense in young adult? Young adult science fiction. Again, this is already starting to branch out, I think. Hello, Across the Universe by Beth Ravis. Love you. The Host, by Stephenie Meyer (okay, I know this one is technically adult fiction, but it really could work with young adult, in my opinion.) I'm really interested to see where authors can go with this. There are so many possibilities. I have no problem with space ships or aliens! Young adult contemporary. I think there's plenty of these books already - Sarah Dessen, Courtney Summers, Deb Coletti, to name a few - but apparently editors want to see more in this area. Since contemporary is the kind of book that has the most tendency to make me cry, I'm willing to hand over my paychecks to read more. The most important thing I like to remember is that no matter what genre it is, if you have a good story, someone will want to show it to the world. I mean, hopefully. Cross your fingers. What genres do you see emerging? What would you like to see?